#AceHistoryNews – Oct.19: Barring the very occasional power cut or Act of God it’s been broadcast every night that Parliament is sitting since October 1945. 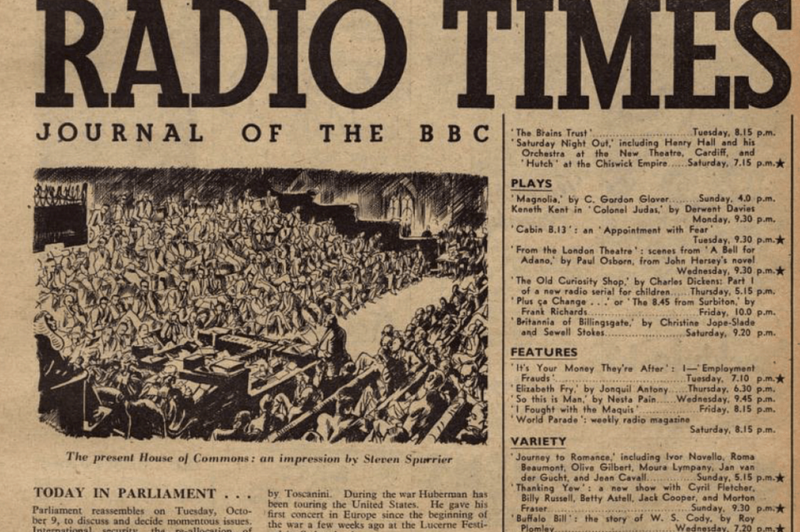 Today in Parliament at 70: Britain’s ‘longest-running soap opera’ Robert Orchard, a former presenter of BBC Radio 4’s Today in Parliament, looks back at the programme’s rich history as it marks its 70th birthday. The tape containing one edition was notoriously left in a taxi on the way from Westminster to Broadcasting House, but was fortunately recovered in time for transmission at 23.30 as usual. As a BBC Parliamentary correspondent from 1992 to 2013, I presented the programme – among others – for many years and, to mark its 70th anniversary, I have been looking back at its most memorable moments. Broadcasters had a long battle to report Parliament at all, but the mood among leading politicians changed during World War Two and that commitment was written into the corporation’s new post-war Charter, making it the only programme the BBC is obliged to broadcast – though which radio or TV channel it appears on, and how long the programme should last, are up to BBC bosses. We have unearthed fascinating archive material – including the original dog-eared script from the very first programme in 1945. And there is the oldest-surviving recording of the programme, broadcast in October 1963, with the announcer – in suitably plummy BBC English – regaling listeners with the colourful prose of the then opposition leader, Harold Wilson. He was lambasting the Conservatives for delaying the next session of Parliament so that its new leader – Alec Douglas-Home – could fight a by-election and become an MP after renouncing his peerage. And there’s the very first, experimental, day of broadcasting sound clips from the Commons in June 1975, with Margaret Thatcher joining Prime Minister Wilson in “rejoicing” at the Yes vote in the referendum to stay in the Common Market! How times change. She goes on to praise Ted Heath – the main she had just ousted as party leader – for leading the Yes campaign. One former editor of Today In Parliament, BBC veteran Bob Clifford, describes the programme as “Britain’s longest-running soap opera”. And if it’s a soap opera, many MPs and peers seem hooked: the Father of the House, 85-year old Sir Gerald Kaufman, says he started listening soon after TIP started after the War. “I can’t do without it. It is more important than it has ever been… A credit to straight reporting,” he says. It was such a fixture in his politics-obsessed family when he was growing up, he says, that his little sister could do an excellent impression of Speaker George Thomas’s lilting Welsh rendition of “Order! Order!” at the age of four! Lady Boothroyd, the 86-year old former Commons Speaker, is another big fan of the programme and also living proof that its late-night slot makes it – for many listeners – what former editor Bob Clifford calls “duvet listening”. No duvet for Jacob Rees-Mogg: he confesses he usually listens while lying in the bath. For Robert Rogers, recently retired as Clerk to the Commons, the Chamber is “incredible theatre” and TIP often the only way it’s properly heard. Now Lord Lisvane, he recalls a day 25 years ago, and the sharp intake of breath on the government front bench when the late Sir Geoffrey Howe delivered the most devastating lines in his deadly resignation speech which triggered the downfall of Margaret Thatcher. In the early days, before broadcasting from the Commons was allowed, the programme was put together in Broadcasting House, several miles from Westminster, with BBC journalists re-writing news agency copy sent via the ever-chattering teleprinters. The 15-minute programme, consisting entirely of a script read by one of the BBC’s top announcers, was, in the words of former producer Bob Clifford, “a nightmare” to produce. To start with, there was no “colour” in the reports. One of those best-known announcer voices belonged to Brian Perkins, now retired. He recalls presenting the programme in the mid-1960s and describes it at that time as little more than a “15-minute humourless dirge”. I first arrived in Westminster in 1984, reporting initially for BBC local radio and BBC Wales. We shared dingy windowless offices – in a long-demolished building where Portcullis House now gleams – with a transient Today in Parliament staff, who seemed rather a breed apart. The current Director General, Tony Hall, did a stint on the programme too, in those far-off days. Things changed a lot in the early 1990s. Most of the Today in Parliament staff became reporters: each taking a separate story – Prime Minister’s Questions, a government statement, a Lords Question – and writing it up and reporting it on air. Finally, the ‘Received Pronunciation’ of the BBC’s top announcers was replaced by the more demotic accents of our own correspondents, myself included. In the 70 years since TIP began, it’s reported on many momentous events but, for me, no Parliamentary story in my time can compare with that extraordinary destruction – on the floor of the Commons – of Margaret Thatcher, who had won the Tories three elections. The 25th anniversary of that political earthquake falls next month. The current government’s wafer-thin Commons majority suggests eyes will be focused more often than in the recent past on the Posh End of the Palace – the House of Lords – where the Conservatives are still outnumbered. Lady Boothroyd rails against David Cameron for stuffing the Lords with what she calls “lobby fodder” to get his bills through, but the Upper House will still be crucial, and TIP will be there to report it. The cross-party committees in both Houses increasingly merit coverage on TIP for their inquiries. To me, they’re where much of the best parliamentary work gets done. They’ve grilled bankers, industry fat cats, media bosses, the great and the good, and the not so good. Their role can only grow in importance. And while filling Today in Parliament can still be a challenge some days, recent changes in procedure to increase topicality… and moves by the Speaker, John Bercow, to champion the rights of the Commons have made Parliament, and so TIP, more newsworthy, and more relevant to the listener. In the early days, the BBC director general, Sir William Haley warned that the programme should guard against including MPs’ “undistinguished wisecracks”. These days, a good joke with a political bite is sometimes the best way to get on the programme. One need only recall how Vince Cable became a household name in 2007 with his “Stalin to Mr Bean” put-down of Labour’s new prime minister, Gordon Brown. So finally, the main news from Parliament again: After more than a thousand episodes and 13 prime ministers, Britain’s longest-running soap opera, Today in Parliament is ready for the next 70 years. Disclaimer: This article is provided by Ace Worldwide News Group.